Changes are in progress! We're updating this information with the new MavScholar. Find sources using guided instructions Coming Soon! How do I know if I'm looking for an article? Publications usually have a volume and issue number so you know exactly which issue of the publication it's found in. Sometimes you'll be on the hunt for one very specific article or Journal. Memorial Library has a lot of sources and there are many ways to track down those specific articles and journals. Use the information below to help you. 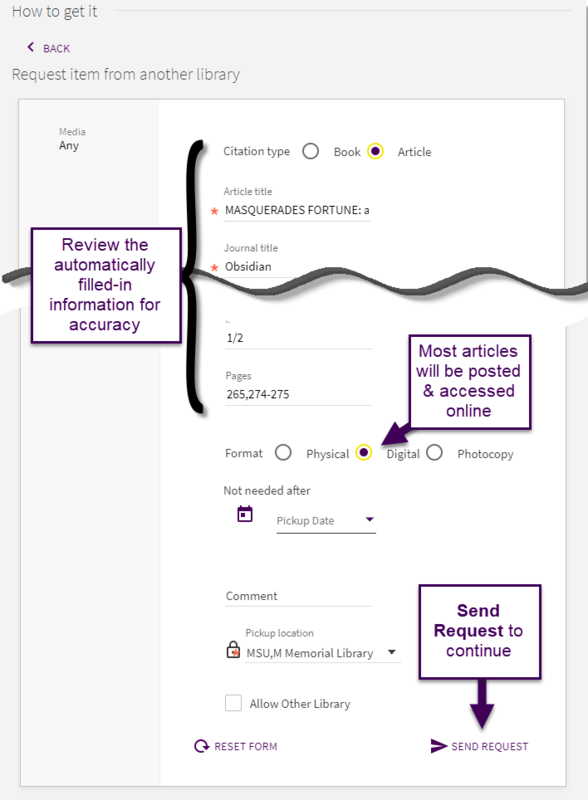 If you're looking for a journal or magazine, first, click on the "Journals List" tab above the search bar in the middle of the Library Home page. Then search for your journal, magazine for newspaper. 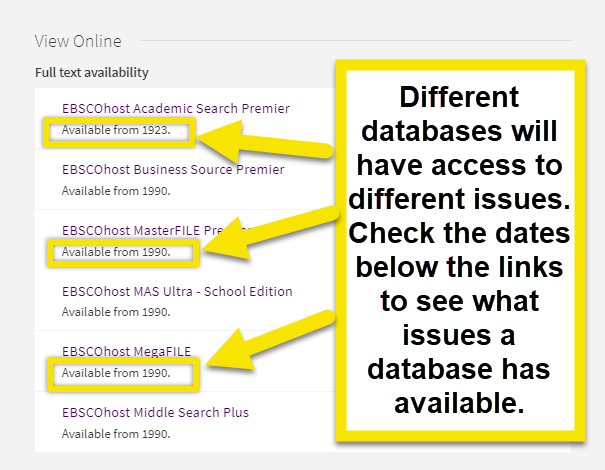 You can search by exact or partial title, or ISSN. Once you've found your journal, it will usually be found in one of two places. It will be either be Available Online or Available at M, MSU Memorial Library in print. Click either link to go to the next step in finding the journal. Sometimes, "Multiple Versions" are available. Click any link in this entry to see all versions. Make sure to check the dates of your publication to see what we have access to. We may not have access to all issues of a given journal. If the journal entry states Available Online you can access the journal digitally on or off campus. 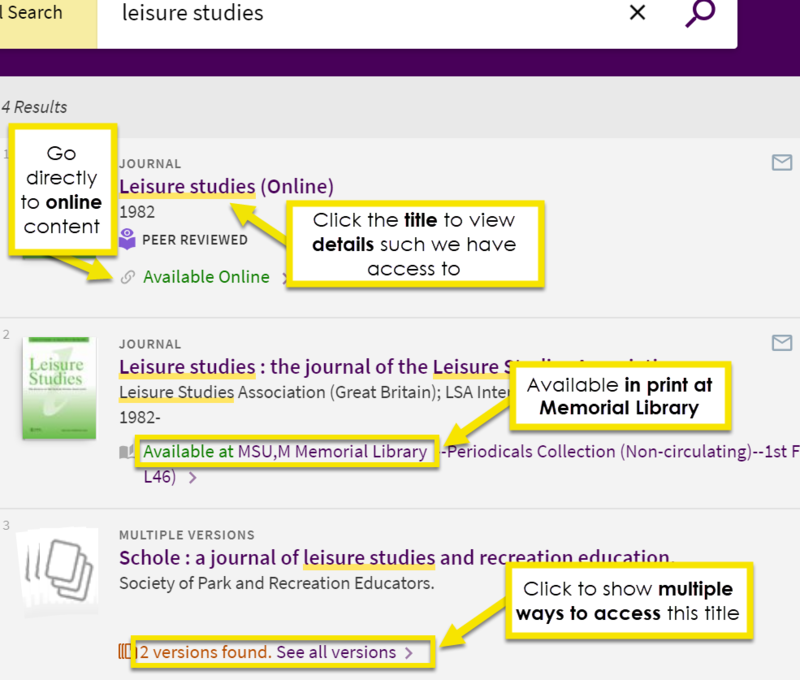 If you click Available Online, you will be taken to a site with the most current access to the journal. If you are off-campus, you will be prompted to enter your StarID information. WARNING: When you click on the links, they will open a new window! Digital copies of the journal will be in this website. Find the issue you need and there's your source! If you click on the journal's title, you will see a record listing all the ways to access this journal in the View Online section . Digital copies of the journal will be on this website. Find the issue you need and there's your source! Scenario 2: Found at "Memorial Library Print Holdings"
If your journal says Available at MSU,M Memorial Library, it means we have print copies in Memorial Library at MSU! Click on the title or the location link. 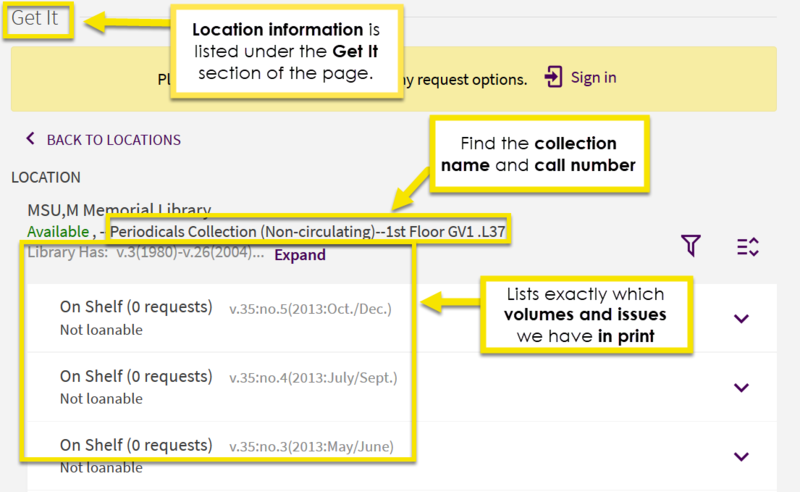 Under the Get It section of the next screen, look for and find the collection and call number. 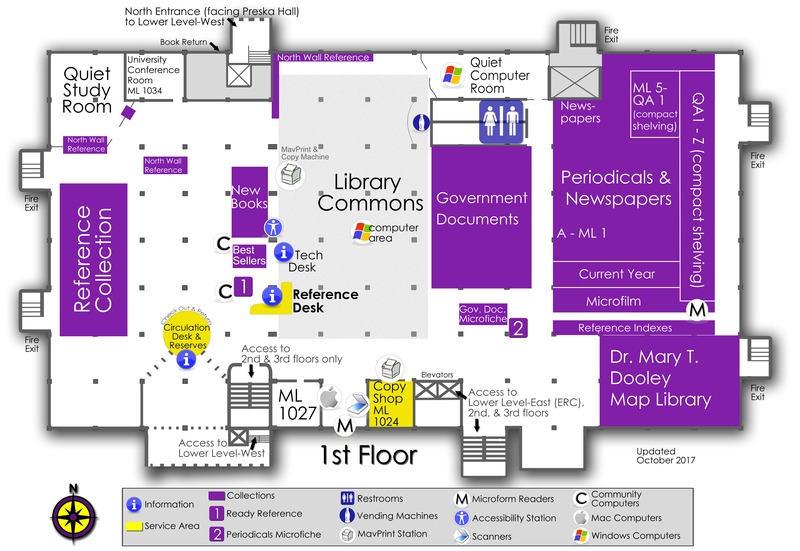 You will need this information to locate the journal in Memorial Library. If you are looking for a specific year, volume, or issue, review the list below the collection name to ensure we have the journal issue you are seeking. Most journals will be shelved within the Periodicals Collection on 1st floor. 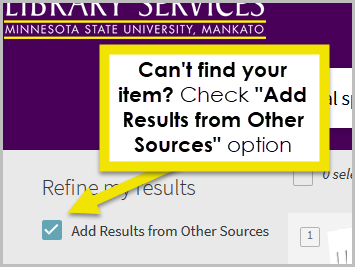 In order to find a specific article, start at the Library Services Home Page. 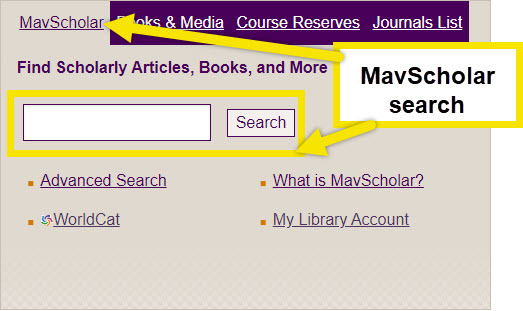 Search for your article in the MavScholar search box. It is best to search by article title. MavScholar will have a lot of different resources. Scroll through the search results to find your article. To make it easier to find your article, consider adding more information in an advanced search. In an advanced search, you can search by language, date, title, or author. Try narrowing the publication date to help you find the article earlier. 2. It will re-route you to a different site like a database. Look for "Full Text" or "Download PDF" buttons to find and access the full article. 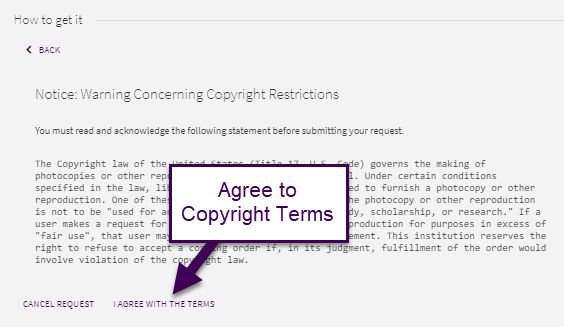 After signing in, click the Interlibrary Loan link. 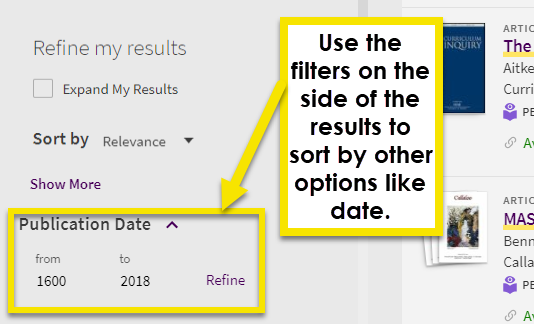 A form will include automatically filled-in information about the article. Double check the information to make sure it is correct. Click Send Request to continue.